Underline consonant blends separately to bring attention to and provide visual support to remind students that each letter makes its own sound. 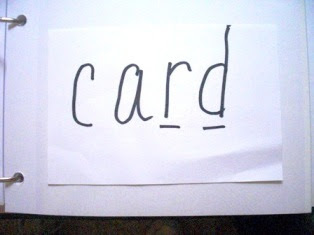 Underline digraphs such as /th/, /sh/, and /ch/ with one line to give students the visual cue that the two letters come together to make one sound. Brain specialist, Fritz Mengert, says that by making a red dot in the center of the word helps students focus on the middle rather than just the beginning of the word. Using a red dot can also increase reading fluency. 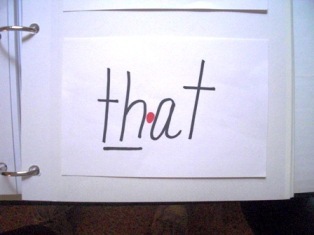 Place a red dot at the end of the line of text and ask students to "read to the dot." The red dot gives students a focal point to aim toward. This tip is for students who have trouble reading an entire line of text from left to right. I was also thinking the red dot tip would work with word family words. When you want students to recognize the word family quickly and blend only the first sound with the rest of the word, it seems to me that the red dot would help set the word family word apart from the rest of the word making it easier for students to see and read. You could also use the underlining technique here and underline the word family part with one line to provide a visual cue and set it apart from the rest of the word. I like the red dot tip. I use the Fundations program for phonics and word studies and there is a specific way we teach the kids to mark up words (much like Saxon) but we don't use a "red dot." I may have to add it to the repertoire! I use the Wilson Foundations Program that also stresses marking up words-digraphs, scooping syllables, underlining double vowels, etc. It really helps my students and makes them more aware of word patterns, structure, rules, and the like! THANK YOU FOR THIS TOOL TOO!! If you have not checked out my Blog, please do! I am always looking for more followers!